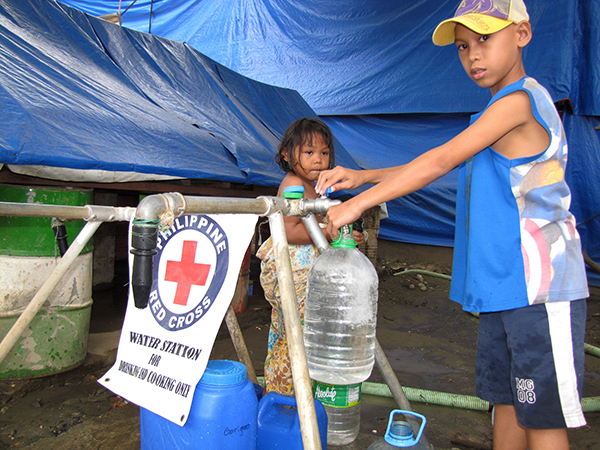 Access to clean water is a turbulent issue in the Philippines. Ally Adigue assesses a murky situation. Access to clean water is an international human right, but it comes at a price. Water is free but getting it clean, safe and potable costs money. Who should pay for it? In the case of Manila, it is unclear. The Philippine Government knew it would cost a lot of money to rehabilitate metro Manila’s aging and decaying water infrastructure. Before it privatised the state-owned Metropolitan Waterworks and Sewerage System (MWSS) in 1997 the MWSS was supplying water for an average of 16 hours a day to two-thirds of the 11 million residents of metro Manila and its adjacent provinces. The tap water was not always fit for drinking and non-revenue water (NRW) or water loss through leakage, meter inaccuracies and pilferage was at 56 per cent. Sewage treatment was at three per cent. Rehabilitating and expanding the network required billions of dollars and the MWSS was neck-deep in debt, around US$1 billion. Cash-strapped and faced with a looming water crisis, the national legislature enacted the National Water Crisis Act of 1995, and the MWSS was privatised. Two separate 25-year concession agreements (CA) were awarded to Maynilad Water Services, Inc. (MWSI) and Manila Water Company, Inc. (MWCI), to undertake the waterworks rehabilitation, and the MWSS service area was split into two zones: the West zone and the East zone, with the contract stating that tariffs were set at a level that allowed concessionaires to recover all costs and expenditure, including Philippine business taxes and debt servicing on loans, and to earn a rate of return on these outlays. Simply put, all the concessionaires’ business-related costs are passed onto the consumers, and the MWSS Regulatory Office (MWSS-RO) monitors and reviews the concessionaires’ performance every five years. Today, 18 years after privatisation, the tap water is drinkable and water supply is 24/7 and a few points shy of 100 per cent coverage, with NRW reduced to 11 per cent, and sewerage coverage increased to 15 per cent. But it has not been a smooth run. Since privatisation, the parties have been through three international arbitrations. In the most recent tariff review in 2013, many expenses claimed by the concessionaires were deemed imprudent by the MWSS-RO, and not approved. Instead, MWSS-RO directed Manila Water to cut its basic water charge by 29 per cent and Maynilad by 4.8 per cent, which prompted the water concessionaires to seek international arbitration. As a result, a number of water and sewerage projects were put on hold. The concessionaires argue that they do not expect all their expenditure to be approved, but say the decision is unjust and arbitrary, and the regulator unilaterally altered the concession agreement and in contradiction of consistent approvals since 1997. The MWSS administration says the previous reviews did not carefully scrutinise the concessionaires’ receipts, to the detriment of the consumers. It also says it was correcting the mistake of previous administrations in allowing the concessionaires to pass on the corporate income tax, referring to a previous Supreme Court ruling that public utilities are not allowed to charge corporate income tax to consumers. In December 2014, the ICC arbitration panel hearing Maynilad’s petitions ruled favourably and the regulator delayed a tariff increase until the ICC ruled on Manila Water’s separate petition, which, in its April ruling upheld the rate cut for Manila Water, although at a lower rate. Despite these conflicting findings, the regulatory office implemented the latter decision, barred both concessionaires from passing on their corporate income taxes to consumers, and ordered a downward adjustment of the tariff. Against this backdrop, activist groups like the Water for All Refund Movement (WARM) and Water for the People Network are resurrecting the anti-privatisation debate, and have called on the government to terminate the legally binding concession agreements with the private utilities, arguing the concession agreement “illegally passes on dubious and onerous charges” to consumers. While public vigilance helps ensure better sector performance, the current anti-privatisation discourse is more misguided and misdirected than informed. Instead of focusing on the cost, the Government should direct the discussion to the importance of treating wastewater; both concessionaires are lagging behind in their targets, and an estimated US$3.37 billion is needed to meet 100 per cent wastewater coverage in metro Manila. A study conducted by the Asian Development Bank found that water tariffs in developing countries in Southeast Asia do not meet operating costs. The study supports the imposition of sewerage charge to cover actual sewerage operating costs but not capital costs, which even in highly-urbanised cities like New York, receives government subsidy. However, government authorities are often reluctant to increase tariffs for fear of public backlash, which leads to deferred maintenance and inadequate service. If the government cannot afford to subsidise the capital costs, and tariffs cannot be raised to recover the costs, then who pays for clean water? Water and sewerage services were privatised because the Philippine Government could not afford to deliver the services itself. The private sector cannot be expected to operate at a loss and consumer fees have to be structured to meet operating costs. Saddled with a huge debt and a dilapidated infrastructure, the Government had to make the concession agreement attractive for the private sector to operate the water and sewerage system by offering a a competitive rate of return. Filipino consumers, however, do not understand or perhaps are deliberately not made aware that the contract allows the concessionaires to pass on all costs to the consumers, including capital costs because their government cannot share the cost with them. The Philippines Government estimates some 38 million cases of diarrhoea are recorded annually, due to poor sanitation and hygiene. It has 38 million reasons why consumers have to pay for clean water. In a country where US$132.9 billion has been lost to corruption in the past five decades, Filipinos are further burdened with having to pay for the entire cost of clean water. Ally Adigue is a PhD scholar from the Philippines studying at Crawford School of Public Policy, The Australian National University.